It has been a month since my birthday has come and gone. Please forgive this semi-retired blonde old man for his skiving ways. I have been hiding my laptop from mama and giving her those big round eyes to claim my innocence. Old man just wanna have fun. Mummy got annoyed and plastered a 'To-Do' list on my forehead. Time to bring out my dusty laptop from hiding. Birthdays come in pairs, or it seems with this Choo household. Life is either that coincidental or the humans are just pure lazy. Mummy says it is meaningful to have birthdays in pairs. No prizes for guessing, I am paired up with mummy on my imaginary birthday. Birthdays ain't birthdays without mahjong. Happy Birthday Grandma! Dumbo LOVES birthday. He recognises the candles. He recognises the cakes. 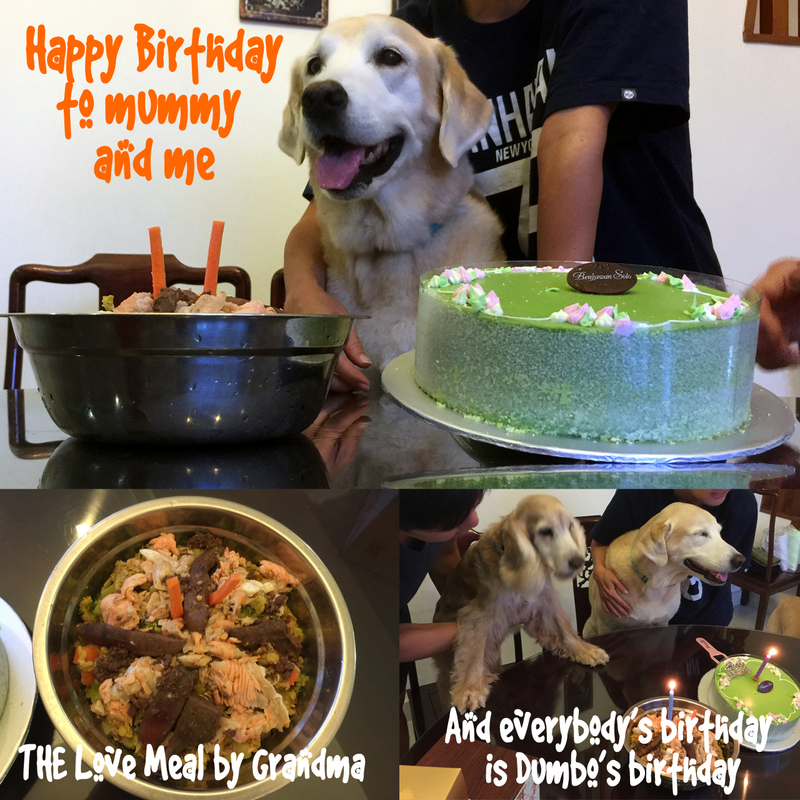 He recognises Grandma's special birthday love meal. 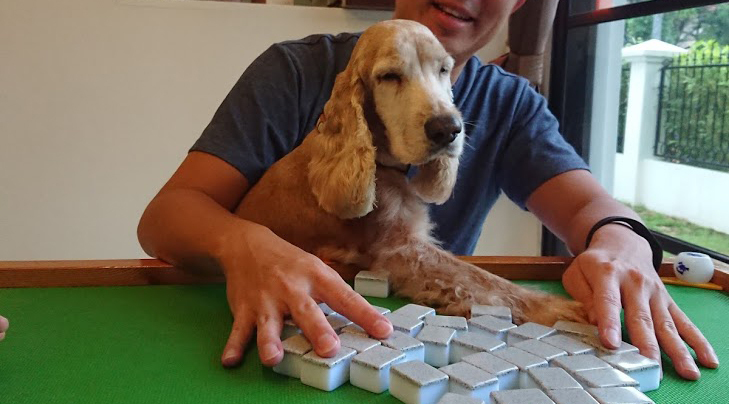 Dumbo is deaf, half-blind and progressing on to senile but he still recognises the humans claps and 'sings' his 'Happy Birthday' rendition in boisterous woofs with much pride. If it makes grumpy old man happy, then everyday can be his birthday. This one minute of birthday fame can be his five. Now that I am 72 years wise (although Pedigree age calculator says I am 82), I have long learnt that my birthday is everyone else's birthday. Too. 'Twas the morning of my birthday. I woke up with much excitement! I wonder what mummy has planned for my birthday this year. I sniffed out two pup cakes which mummy collected the day before. Mummy has been very secretive about my birthday plans. I heard many whispers between Uncle Nic, Daddy and her. I heard something about a yacht. I heard something about 'I think it is going be Frodo's birthday instead'. Whatever Mummy has in stored. I know it should be something pretty darn awesome. I opened my eyes expectantly, hoping that I would be served breakfast in bed. I am a good 'ol fashion boy who believes in good 'ol fashion romance. Unfortunately, romance is not synonymous with mummy. No breakfast in bed. No "happy birthday sweetheart". All I got was barking orders from Empress Dowager to get out of bed. "Flapper Choo! (When the 'Choo' is called, mummy is getting a little annoyed) We are going to Love Cope this morning to celebrate your birthday. What would you like to wear? ", mummy asked with irritation in her voice. LOVE COPE! I am going to spend time and Happy Birthday with my lovely groups elderly. Woohoo! Now mummy is talking my language. In a flash, I sprang out of bed and my body is 11 months young again. "Can I go in my birthday suit? ", I replied. Mummy pointed to my world map body. Oh yes. My idiotic brother has been treating my body as his artistic canvas of late and chewed UN-Holey patterns out of me. Cover up needed, i-Sigh. 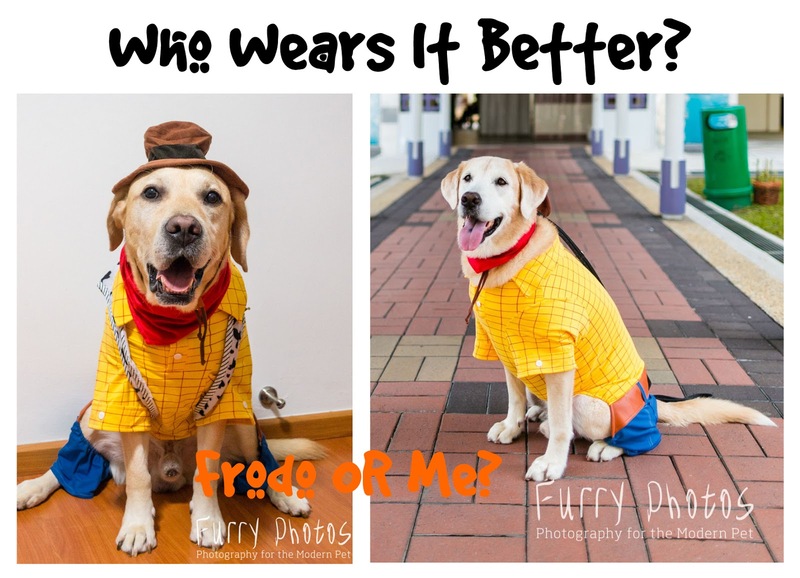 "I'll wear Frodo's Woody outfit", I told mummy. "You sure? You know that everyone is going to say that Frodo carries the outfit better, right? ", mummy asked. "I don't want to look like I am attending a funeral with my Shogun outfit. Birthday is meant to be bright and happy. Frodo's outfit is all that. ", I replied. "And you know better than anyone else that no matter what he wears and even when he is farting, everyone will always think Mister Universe looks better and is cuter. ", I retorted with a wry smile. Mummy nodded her head in agreement. Woody outfit it shall be! Uncle Nic came to pick us up. How exciting! For the first time, daddy is joining us at Love Cope. I could not wait to 'show off' what I do. Uncle Nic drove us to Bengawan Solo to pick up the cakes I ordered for my lovelies. I broke my doggie-bank to pay for it. My Treat. For my Lovelies. We arrived early at Love Cope. Everyone squealed in delight as they saw me in my Woody outfit. Aye aye! 'Woody' Flapper reporting for duty! With many thanks to Uncle Nic (Furry Photos Pet Photography), the photos tell the story of my fantabulous morning with my lovelies. Need I say more? After spending quality time with my lovelies at Love Cope, we headed home to get ready for part 2 AND! Wait for my epic birthday cake from Barkery. Ah! THAT tail about the trash can. Truth is, I LOVE the trash can, dustbin, trash bag etc. etc. Like LOOOOVVVVVEEEEE the trash can. I once visited Auntie Angela's home and immediately navigated my way to the kitchen. Apparently, in less than 2 minutes of stepping into the house, I had opened up a trash can and mummy found me with my head stuck into the bin. I am only an angel when mummy is watching me. One Time in band camp.... One time at my buddies' place, I laid quietly at mummy's feet. As she walked away, I kept a close eye at her to ensure she is out of sight except I did not know she could still see me from afar. I started to 'Pink Panther' out from under the table and quietly attempted to sneak to the kitchen. Everyone reported to mummy that they saw me sneakily take a few steps and I would turn my head to check if mummy could see me. When I finally made it to the bin, I heard a loud booming voice. "FLAPPER CHOO! WHAT DO YOU THINK YOU ARE DOING?". Oops. 'Flapper Choo' means I am in trouble. I nonchalantly made my way back to under the table and gave mummy my innocent look of "what did I do?". During the last day of filming for 'My Dog Dou Dou', there was this moment when mummy needed to use the toilet. Since I appeared to be such an angel and everyone on set had gotten to know me, my favourite 'ah longs' (loansharks) volunteered to help watch me. Mummy sighed and said, "You wait and see. Once I am out of sight, he would head straight for the bin and stick his head in." No one believed her. Upon mummy's return, the 'Flapper bin report' came fast and furious. "Oh my God! After you left, he went straight for the bin. The minute we shouted 'Flapper! ", he dug his head deeper into the bin!". Mummy replied with a smirk, "I told you....". Shortly after, mummy looked at them and said, "Let's talk and pretend to look busy. You watch. When Flapper thinks that I am not looking, he will try to make his way to the bin... again." So the 'ah longs' played along and as per mummy's prediction, I headed to the bin and yep! There it goes again... "FLAPPER CHOO! WHAT DO YOU THINK YOU ARE DOING?". Fell right into mummy's trap. I slowly made my way back to my lonely pillow, slumped myself down with a loud thud and conjured the saddest look I could muster with eyes that said, "Oh mummy.... How could you embarass me this way." I think I am a Chihuahua and no one can see me sneaking to the bin. Flapper, when you pass on, I am going to put you in a trash can. Aye aye. I exasperate mummy so much with my love for trash cans that many many moons ago, she declared the best resting home she could give me is a trash can. For many years, she has been looking for a 'Oscar The Grouch' trash can. No no. Not that mummy is cursing me. She just thinks it is darn hilarious. And couple of months ago, she finally found THAT trash can. With one paw in the bin, Mummy finally found this tiny trash can. Hmmm... not sure if it can fit all of me inside but rumour has it, the other half of me will go to the sea - my other happy place. Along came THE 'Flapper-in-a-Trash-Can' cake. Mummy thought very hard about the birthday cake design. Truth be told, she was running low on ideas this year. So she thought about my bucket list and 💡! 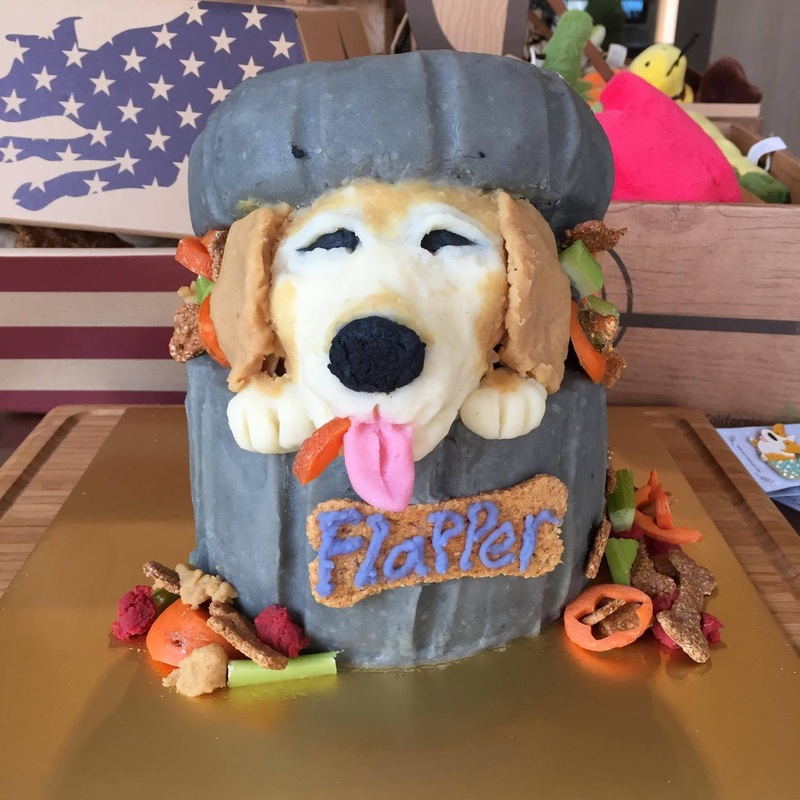 She quickly messaged cheh cheh Ann from Barkery and asked her, "Do you think it is possible to make a 'Flapper in a Trash Can' cake this year? You know, like Oscar the Grouch in a trash can except it is Flapper's head sticking out." Mummy sent an image of Oscar the Grouch in the trash. Cheh cheh Ann said they will try but she was also not sure if it could be executed. After all, the Queen of 3D sculpting had put down her sculpting knives and retired. There were a few discussions about possible execution issues but mummy had faith that they will pull it off somehow. There was a knock on the door. It was cheh cheh Ann! O.M.G.! I could sniff the fish-base cake out. I may be old but my nose is working very well, thank you very much. Mummy nearly burst out in tears. ONCE AGAIN, BARKERY SINGAPORE HAS OUTDONE THEMSELVES AND EXCEEDED EXPECTATIONS. "You are so so lucky. My aunt (Queen of 3D) was there and we managed to get her to help with the cake. ", cheh cheh Ann gleefully explained. "For once, the luck is on Flapper's side", mummy gushed with happiness. The size of the cake was perfect too. Mummy heaved a big sigh of relief. She had been worried that the cake may be too big to bring on the yacht with us. Barkery's cakes are made of fresh ingredients so refrigeration was necessary. Mummy declared to Uncle Nic and daddy, "You boys take care of everything else. I am guarding the cake only." Flapper-in-the-Trash-Can in its full glory before it went a little wonky, no thanks to mummy's lousy guarding skills. Queen of 3D even sculpted in my distinguished white face and can you see all the intricate details right doen to the trash? THANK YOU BARKERY! This is a truly stunning cake. Flapper In A Trash Can? CHECK! Mummy was happy this adventure was finally happening. This year was especially difficult to get an adventure going. She was running out of new ideas, birthday swim is a must and most of all, there were not many places we could go to. We live in a small dog-friendly country. For whatever lousy recommendations these websites or blogs put about "dog-friendly" hotels in Singapore, it is only applicable to small dogs. I wonder how much they are paid for their overglorified articles with superficial information.... hmmmm. Anywoof, mummy was not getting much 'feel' about staycations either this year. She tried for the sake of trying but her enthusiasm was lacking. Uncle Nic and daddy had already taken leave so she did not want to disappoint anyone either. She spent MONTHS mulling about what to do for my birthday and she was close to not wanting to do anything. She was tired. Very tired. Anywoof, about a month before my birthday, she decided to go 'yacht renting' google window shopping. She decided to 'shop' at m-barq by Marine Bookings and well, I think at desperate times, prices somehow appear more reasonable. She decided 'what the heck' and communicated with the friendly online staff to find out more. Of course, first thing she asked about is dogs-on-board. 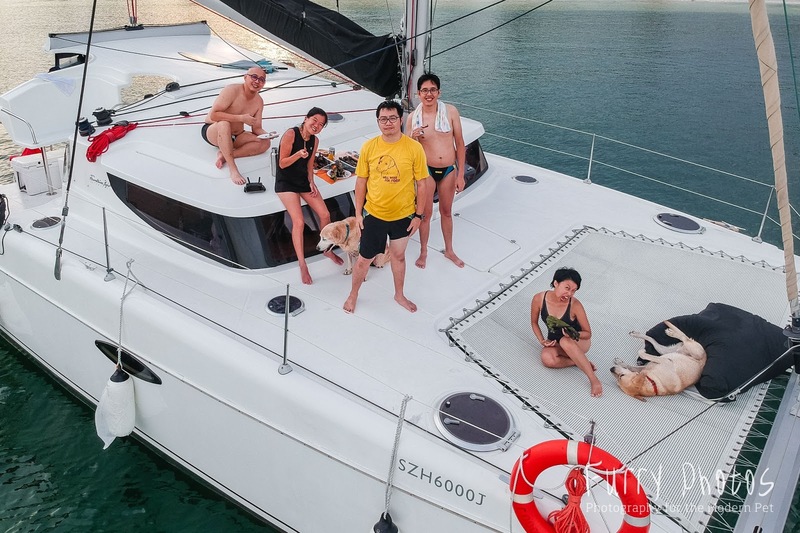 Apparently, there is only one yacht that allows dogs - The Vantage. The lady efficiently emailed mummy the information and crunch time - $1,300 nett (promo price) on weekdays for 5 hours. A short sail to St John's Island or Lazarus Island.... that's about it. $1,300 for a private yacht seems reasonable BUT she was having a mental cha-cha about the extravagance for 5 hours. While her head was whirling in financial justications, she continued to chat with the patient staff of m-barq who entertained her endless questions. Tempted, but she could not decide. Although Lazarus Island is nice and we (Frodo and I) loved it, but mummy was not so keen on repeating a location. She would rather international location. But of course, no chance of that. Mummy consulted daddy and it was a resounding yes. Mummy was surrounded by water-babies. Daddy started relating tales of his diving days to her so it was clear he was excited about a possible yacht trip. Mummy told Uncle Nic to pack his bags for the yacht trip and thank Daddy for the decision she had made. Most of all, mummy did not want to regret. 'What if next year never comes?' (touch wood). That was how yacht adventure came to be. Vantage for the vintage it shall be! The vintage on the vantage in this group was mummy and me. The Vantage is a nice, well-maintained small yacht suitable for small parties. The recommendation of up to 30 guests was stretching it. Our cozy group of five was good. Very good. We never got to see the interior/cabin because we were only informed by the Captain when we got on the boat of the 'no dogs allowed inside' rule. Mummy was slightly pissed off of not being informed of that rule beforehand but she refused to allow it to spoil the fun so she accepted it. The next decision mummy had to make was - do we dock at St John's Island or anchor at Lazarus Island and swim to shore? After some discussion, it was decided that it shall be the latter. Mummy was a little worried about us swimming the distance but she had faith that Frodo and I were such good swimmers, it should not be a problem. And ship ahoy! Time to set sail to Lazarus Island! Ship ahoy! Away we go to Lazarus Island! 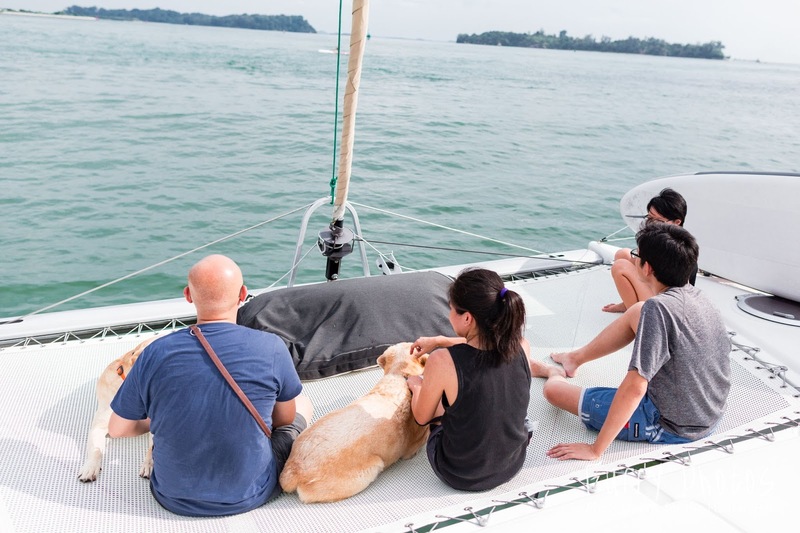 For the month leading up to our Vantage trip, I could hear whispers of 'Will we end up with a dog overboard?' (Frodo) and 'I think this is going to be Frodo's birthday instead'. But it was indeed Frodo's birthday instead. You see, with my lousy hind legs, I do not enjoy treading on 'shaky' or unstable surfaces. The floor surface was a tad bit slippery (a human did suffer a big fall) and I did not particularly enjoy the rocking motion of the boat. Frodo, on the other hand, totally enjoyed it. Mr Lightfooted easily balanced even while the boat was going through choppy waters. This was clearly Mr Yuppie Frodo's thing more than mine. And yeah, it was Happy Birthday daddy too! It took me a while to like being on this funny thing called a boat. But I did eventually and well, with all that swims, how could I not come to like this adventure? Mummy had plans to play with my new Xperia XZ1 phone but when we arrived at Lazarus Island and realizing the hassle of protecting the phone, she decided to leave it behind and focus on having fun with us instead. Daddy has not been feeling too good the whole day so decided to canoe himself to shore instead. As it turned out, Uncle G is a fantastic swimmer! Mummy was so so glad he was there! Getting us to swim to shore was the easy part but getting us back on the yacht, that was the difficult part. So yay Uncle G! You are our new swimming hero! Do you agree that it was actually Frodo's birthday? Mummy nearly died from cleaning me up. As some of you might know, I am the master of sand-rolling. This time, however, the sand had set into cakes from the yachting duration. Mummy ALMOST shaved me down as she struggled to wash the sand off. It was cruel clumps of sand that refused to leave me. After some half an hour of scrubbing me silly, mummy gave up. She rinsed me down and apologized to daddy that he was going to live with Sahara for a few days. Where I laid, there was a sand outline of me. Oh Mr Sun... Will I ever get to do this again? I love birthdays. Thank you Uncle G and Auntie RQ for joining us on this adventure and the ridonculously big angpow. Thank you Uncle G was being such a great swimmer and helping to get two big blonde elephants back on board. We were so blessed by your presence.... that itself was enough. Thank you Dr A for getting me my very own Littman stethescope! You're da best! Flapper Nightingale needs to put one serious work-face with his stethescope. 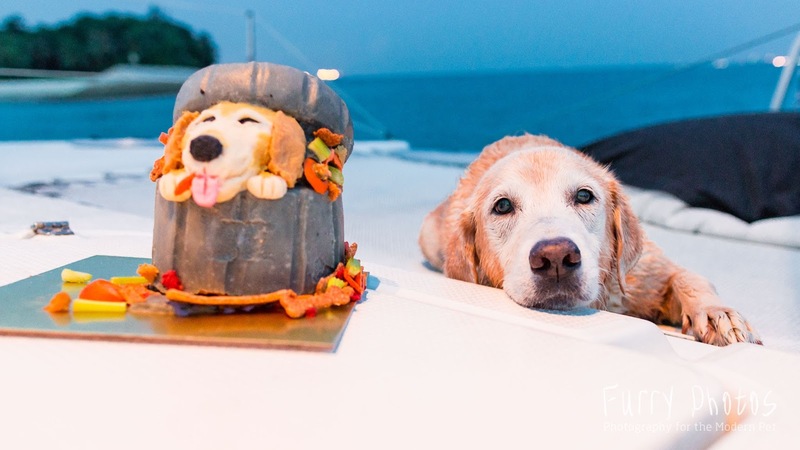 Thank you Barkery Singapore for that epic Flapper-In-A-Trash-Can birthday cake! It made my 11th birthday all that more complete and meaningful. Thank you Uncle Nic for once again being there with me for my life moment AND the gorgeous photo book with the best memories of our year gone by since my last birthday. All our WETnesday memories in one book. Love love love it! My 'Year Book' from Uncle Nic. And I am officially 11 years old.